This article is a short summary of Mario Party: The Top 100. Mario Party: The Top 100 is a minigame compilation title in the Mario Party series. The game was released for Nintendo 3DS in November 2017 in North America, and was released in December 2017 in Japan and PAL regions. Mario Party: The Top 100 features a total of 100 minigames from across the series' core home console installments. The game features local multiplayer via Download Play. ↑ 1.0 1.1 1.2 Mario Party: The Top 100 - Announcement Trailer - Nintendo 3DS. Nintendo (September 13, 2017). Retrieved September 13, 2017. ↑ マリオパーティ１００ ミニゲームコレクション [Nintendo Direct 2017.9.14]. Nintendo 公式チャンネル (September 13, 2017). Retrieved September 13, 2017. 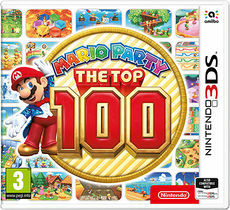 ↑ "#MarioParty: The Top 100 arrives on Nintendo #3DS systems on 22/12. Yep, December 22nd!" Nintendo of Europe on Twitter (November 13, 2017). Retrieved November 13, 2017. ↑ "#MarioParty: The Top 100 arrives on Nintendo #3DS systems on 22/12. Yep, December 22nd!". Nintendo AU NZ on Twitter (November 13, 2017). Retrieved November 13, 2017. This page was last edited on 27 October 2018, at 00:58.